Have you always dreamed of owning a foam mattress? You may have viewed it as a next to impossible desire, but that’s no longer the case. A wide variety of new companies have entered the market place to help regular consumers purchase high-end foam mattresses. Tempurpedic and other large mattress companies have long priced out the average American shopper – but don’t worry, there are new competitors in town. In this review, we will be pitting two of these newcomers against one another. Tuft & Needle and Purple are two of the most popular new foam mattress companies currently operating in the United States. We will overview the major characteristics of each mattress, so you can better decide which one is the exact right mattress for you. Remember to check out some of our other reviews as well – we have an extensive comparison database on our site! Purple mattress is an online mattress production company that has grown increasingly popular over the past two years. They’ve tried to create a mattress that appeals to the vast majority of sleepers – it has a wonderful feeling without sacrificing a great deal of support. The mattress company also has an awesome reputation for customer service – they include a 10-year warranty with all their mattresses, as well as a 100-day money back guarantee. In addition, as long as you live in mainland USA, you’ll never have to pay a dime for shipping. Purple also builds all their mattresses right here in the United States so that they can have a direct role in quality control. 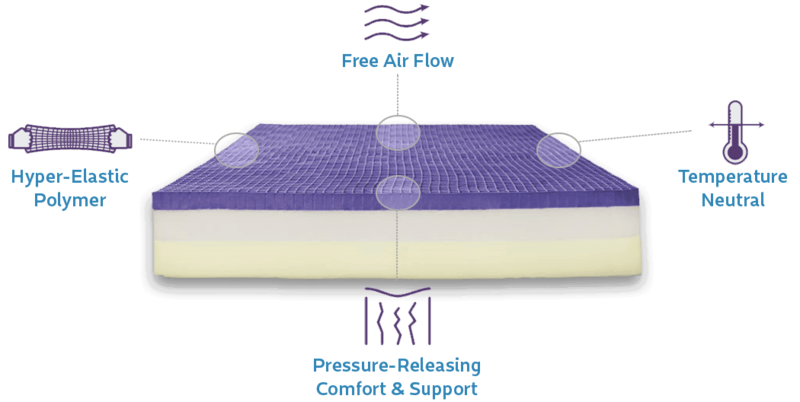 Purple uses a three-layer system to provide their customers with the most enjoyable mattress possible. They do so in order to take advantage of a range of unique materials – you’ll find that they offer one of the most recognizable mattress types on the market. Each layer will be explored in further detail below. This is a hyper-elastic polymer layer that is two inches thick. It creates an extremely soft point of contact that provides a nice hug around your body when you lay in it. It’s the exact type of material you’re looking for when it comes to memory foam. It is also much more breathable than traditional foam, which means that it won’t retain as much heat. This layer is a nice buffer between the top and bottom layers. It provides a bit of support, while still aiding in the comfort department of the mattress. It is made from 3.5” of polyurethane foam. The mattress wouldn’t be a mattress without its support layer. This is 4” of higher-density polyurethane foam – it’s an awesome foundation material to have. The total thickness of the mattress is 9.5” – which is in line with many mattresses in the foam mattress industry. This is another mattress cover that uses a blend of materials to try and provide a durable and elastic cover that doesn’t trap too much heat inside. Many people think that having a thick mattress cover is necessary if you’re buying a top-end mattress – this isn’t true. The thicker your cover is, the more heat it will trap. In addition, you’ll find that thicker mattress covers are much more of a pain to clean in the case of a spill or other accident. The Purple mattress cover is made from a combination of viscose, polyester-lycra, and polyester. This has given it the ability to be durable, flexible, and easy to wash. If you’re looking for a mattress that has plenty of support for a person of a normal weight distribution, the Purple mattress is most definitely one of the better options. It provides a just above average support score. This is perfect for those who are not heavy sleepers – it provides enough support and comfort to let you have the best possible sleep. Purple has grown reputable for being able to help certain people fix their poor sleeping behavior. Many people have reported that lifelong poor sleeping habits, such as odd sleeping positions, have been cured by using a Purple mattress. If you’re looking for a mattress that may encourage you to sleep on your back, you may want to consider a Purple mattress a bit more. If you try and put your finger on who started this new, affordable mattress revolution, it’s hard not to point to Tuft & Needle. They’ve transformed the industry by providing extremely affordable, high-quality mattresses to everyday consumers in the United States. Their products are considered to be extremely comfortable, and they have a great reputation with their past customers. The company was started by two tech entrepreneurs in Phoenix, Arizona back in 2012. They have a showroom in the city, and also offer free same-day delivery for anyone in the metro area. If you don’t live in Phoenix, you can use their online shop to order a mattress to anywhere in the country. They offer free shipping nationwide. They also include a 10-year warranty on all their products, as well as a standard 100-day money back guarantee trial period. The Tuft & Needle mattress takes on the most basic approaches to mattress design. They have attempted to build a luxurious mattress only using two layers of foam – it has been a very remarkable success. Their mattress has the perfect combination of support and comfort, it has been widely praised by many people who have purchased it in the past. We will overview the two layers and their purposes in more detail below. This layer is constructed using 4” of poly foam – it is extremely comfortable and provides a great soft touch for when you first lie on the mattress. The thick nature of this first layer has allowed for the mattress to provide comfort and prevent heat retention. The bottom layer is all about support – this foundation is 7” thick and made from support foam – which is a highly dense foam that provides firmness to the rest of the mattress. The size of this support layer really allows the mattress to provide as much stability as necessary to ensure a good night’s sleep for those who like a much firmer mattress. The mattress is 11” thick in total, which means it is one of the thickest mattresses on the marker – much thicker than the Purple mattress. Easy to Clean – The thinner a mattress cover is, the easier it is to clean it. Feel the Mattress – Mattress covers that are too large often get in the way of the mattress, this is a shame if you’re trying to enjoy a luxury mattress that you’ve purchased. Realistically, if a foam mattress provider is providing you with a mattress cover that is extremely thick, this is most likely for show, not function. The reality is that the thicker the mattress cover, the less enjoyable it will be. People often make the assumption that a two-layer mattress won’t be able to provide enough support. This may seem especially true with a mattress that has as large of a top layer as the Tuft & Needle mattress does. But the Tuft & Needle is actually one of the firmest mattresses that we’ve tried out. It scores at a 6.5/10 – a firm score for a foam mattress. If you happen to be a heavier sleeper, you will most likely be much more suited to a Tuft & Needle mattress instead of a Purple mattress. This is because there is a remarkable difference in the amount of support they offer. In terms of breathability, the Tuft & Needle does very well. Even though it has a thick upper layer, the mattress does well to ensure that the components involved don’t retain too much heat. As you will find with many foam mattresses, heat retention is a big problem – this mattress does a great job of ensuring this isn’t the case. Warranty – Tuft & Needle offers a 10 year warranty on their mattress, which is standard for the industry. Choosing between these two unique mattress types is a very hard decision – it will most likely come down to personal preference. Naturally, if you’re someone who needs more support out of their mattress, the Tuft & Needle is going to be your best option. At the end of the day, the large support layer it has at the bottom of the mattress means that you won’t ever have to worry about lacking support as long as you are not an extremely heavy sleeper. On the other hand, those who are lighter sleepers will probably prefer the softness associated with the Purple mattress. The top layer of the Purple mattress is truly unique and provides a great surface for you to sleep on – it’s hard to beat this mattress if you like soft materials that create hug and contour around your body when you sleep. In this regard, it appears to be a much more traditional foam mattress. If you are indifferent to support, you may find the Tuft & Needle mattress is the best value for money. They truly have the cheapest high-end foam mattress on the market. It’s truly remarkable the level of product they are able to offer you for such an affordable price. With both mattresses, you can return the product free of charge within the first 100-days of purchasing. For this reason, there really isn’t an excuse not to try one of them out if you’re in the market for a new mattress. If you feel like neither of the mattresses mentioned in this article will be able to provide you with what you need to get a good night’s sleep, make sure to check out our other comparisons. We’re experts on mattresses and have all the information you need to find the perfect one for you!